The Alberta College of Art + Design will officially become the Alberta University of the Arts (AUArts), the province’s first university dedicated to fine arts and design. 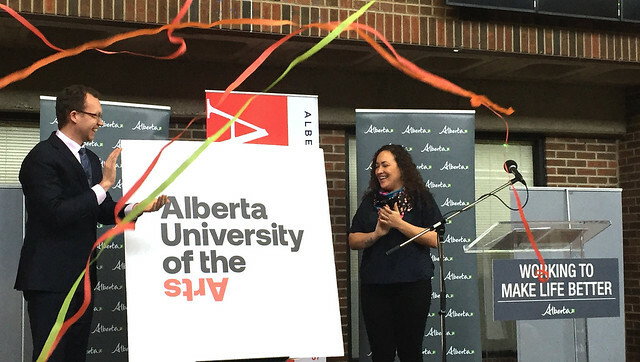 Minister Schmidt and Simone Saunders, student association director of leadership and governance at ACAD, unveil the new name and logo for the Alberta University of the Arts. The new name and status formally comes into effect on Feb. 1. Since 2015, the institution has received about $4.6 million in additional provincial funding to support its operations and long-term sustainability. The increase is part of the two per cent additional funding provided yearly to all public post-secondary institutions through the Campus Alberta Grant. To ensure students have access to modern learning facilities, government also provided $2.5 million to the university this past year. The announcement comes during Alberta’s Month of the Artist, the first in Canada dedicated to the celebration of artists. Last year, the Alberta government granted university status to the institution to more accurately reflect the mandate and high-quality degree programs available. The university offers a number of degree programs, including a bachelor of fine arts and a bachelor of design at the undergraduate level, as well as a master’s degree in fine arts. These changes are one of many actions the Alberta government is taking as part of its commitment to ensuring the post-secondary system is accessible and affordable.